In todays day and age it isn’t uncommon to see products belonging to large brands appearing unashamedly throughout Hollywood blockbusters. The general public refer to this type of advertising as product placement, but a more common name is embedded marketing which is when a well known branded product is placed in a context usually outside of the advertisement sphere like a movie, music video or a television show. In a study put together in 2006 a television trade magazine named Broadcasting & Cable reported that approximately two thirds of advertisers employ some form of branded entertainment in the hope that viewers of the movie or television show could make some form of emotional connection to the featured product. When talking about major movie productions, embedded marketing can trace its roots back to 1927 in a film called Wings which featured a plug for Hershey’s chocolate. Although at the time this form of advertising was extremely rare, and didn’t become common place until the early 1990’s. I often find myself sitting through a movie purposely looking to see if I can spot any instances of big name brands appearing, and although I have probably missed a large proportion of the movies plot, it is quite intriguing to actually see how often household named products appear. In 2010 Apple was recognized and awarded the prize for overall product placement in movies by Brandcameo after they announced that the brand featured in ten (30%) of the years thirty three number one box office films. This statistic meant that Apple appeared more than any other household name including Nike, Chevrolet, Sony, Dell and Land Rover which all featured in the top five. With the above award in mind, it should come as no surprise that Apple products actually feature quite frequently throughout Hollywood, with noticeable appearances in movies such as Independence Day, Mission Impossible, Legally Blonde, Step Up 3D and Law Abiding Citizen. Bearing these figures in mind, the good people at AnyClip set about creating an impressive infographic using their own AnyClip Solutions API to showcase not only Apple product placement in cinema through history, but to also produce a ratio of appearances compared to other products. One interesting thing about this graphic is the contrast of product placement between movies. 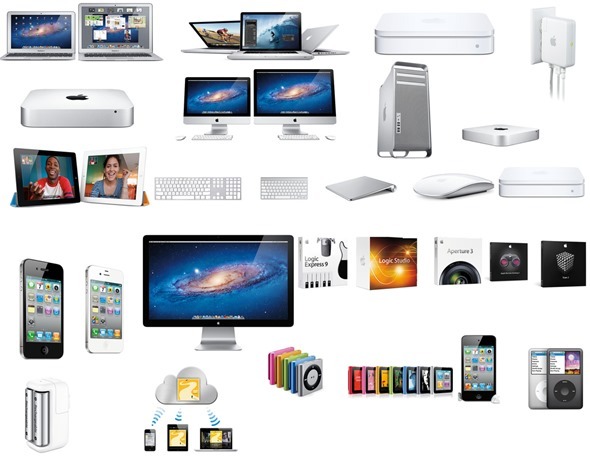 The Transformers movie is well known to be splattered with a plethora of companies products, and although Apple products appear on screen for a combined total of six minutes, this only accounts for 1% of total placement. This is in direct contrast to a movie such as You’ve Got Mail in which Apple products accounted for 33% of all product appearances. The fantastic graphic is shown below, are you shocked by any of the films that Apple has been featured in?